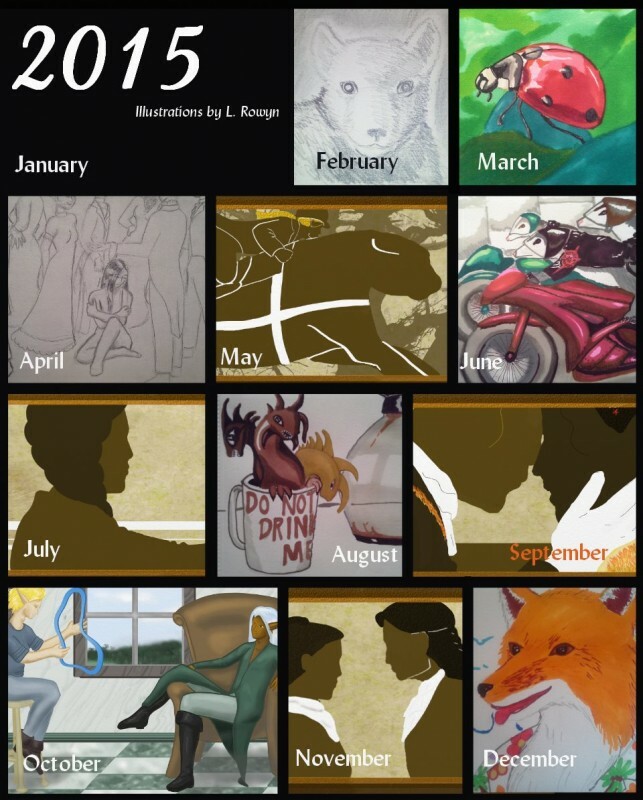 I drew many pictures in 2015! Enough that I decided to do a picture-a-month collage, which I gather is a DeviantArt thing? I don't know if I did it right. Especially since I had to leave January blank because I drew absolutely nothing during it. I didn't start working on headers until April, and February was the first month that I started going to Panera and doing sketches from Twitter user prompts. February: a sketch for @ChipUni's prompt of "werewolf cub on moonlit night". March: A ladybug for ankewehner, from her Twitter prompt. April: For alinsa's Twitter prompt: "Isolation". May: I could have used headers for every month from April through November, but I wanted some variety. This one is of Anthser and Nikola during the bowrace. I'm using these from the month I completed them, not the month they were posted. June: For iron_fox21's "opossum motorcycle gang" prompt on Twitter. The shoulder patch that is too small to read says "Brothers of the Pouch". July: Wisteria, from the header where Nikola kisses her hand. August: "Coffeemonsters" for Twitter user @MorganRLevine. The droopy one is the not-enough-coffee monster. September: Wisteria and Nikola, from the scene of their first kiss. October: One of the few illustrations that was neither a Twitter prompt nor an RA header! Frost giving a lesson to his apprentice, Thistle. November: Wisteria and Justin when he called on her after the rescue. December: From a Twitter prompt: iron_fox21's fursona. This sketch is okay. It'll look better when it's colored. ... no, that made it much worse. I have no idea what I'm doing. Why do I keep using the marker and airbrush tool for everything? This part is a disaster. Let's just do a different part. ZOMG painting with a reference is wonderful why do I not always use a reference? Why do I ever paint anything but naked torsos this is the best ever. Except maybe horses. actually this robe is kind of fun too. Why are hands so hard to draw? I even have a reference why can't I do this? that's it I give up YOU ARE CRUEL, HANDS, CRUEL and I'm leaving you for hair. ... oh wait that one part is still bad. NO NOT THE HANDS I HATE YOU HANDS and you're just going to stay bad. That other part. How did I not notice until now that the proportions are completely messed up here? I should do a simple background thing. Huh. Is that how it looks at the end? I thought it was gonna be better. I'll put the picture behind a cut-tag. It's a beefcake picture of Frost, because I decided if I'm mainly drawing him 'cause he's pretty I might as well go full objectification with it. I have three finalists! You should be able to click to enlarge any of 'em. They're shown in the poll at the thumbnail size used on Amazon. But inching closer. These are my two contenders at present; I can't quite making up my mind whether I like the nested "A Rational" or not. I think it looks a little more elegant and is a little less readable. Hrmph. 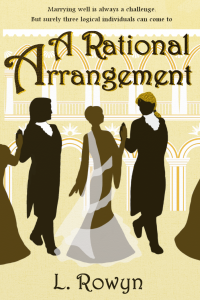 alinsa wanted to take a stab at it, so I will see what she comes up with before I make my final decision. But I don't think I'll be making any more significant changes myself. Perhaps fiddling with the teaser text. 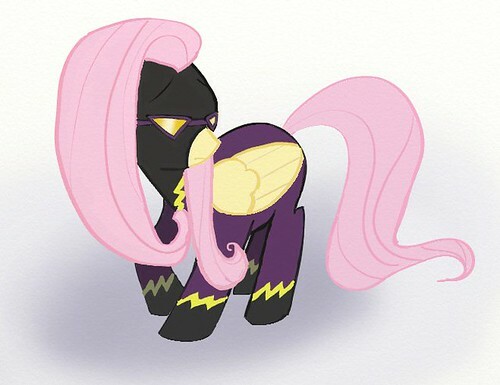 Fluttershy-shadowbolt, originally uploaded by Lady Rowyn. Okay, this one is terrycloth's fault. This is my first attempt to synthesize my own pony; I used a bunch of ponypics for reference, but it's not actually a copy of any given picture. The Mane Cast, originally uploaded by Lady Rowyn. Maybe I should blame terrycloth, because he's the one who got me started watching the show, but no. I blame the_gneech for this one. I watched the Gneech Livestreaming the creation of his last ponypic, and watching someone else draw a pony made me realize what freakish little creatures these guys are. Their proportions are bizarre: their eyes take up about a third of the space on their faces, their foreheads are gigantic, they have these teeny button muzzles that are maybe half the size of one eye, and their bodies are only slighlty larger than their heads. No, really, if you take a typical image from the show, the distance from base of neck to top of head is almost as long as the distance from base of neck to bottom of foot. And yet, somehow, they're adorable anyway. Since it's an animated kid's show, the characters are colored very simply as well as highly stylized, and it made me wonder how hard they are to draw. Finally, I decided to go ahead and try it. Answer: DAMN HARD. I spent over two hours sketching them by staring at screenshot references and freehanding copies -- all of these sketches are copies of poses from the show. Copying an image, or working from life, is much easier for me than trying to draw from my head. But even with a reference right there, I struggled trying to make the copy look like the original. My sketch of Rainbow Dash looks like Twilight Sparkle to me and I don't even know why. @. @ Even knowing that the bodies are supposed to be tiny, I still drew them a little too large. It's just ... weird. In theory, I don't think of fan art as the highest and best use of my creative energy. In practice, pretty much all the art I do is fan art, albeit usually for more obscure fandoms. 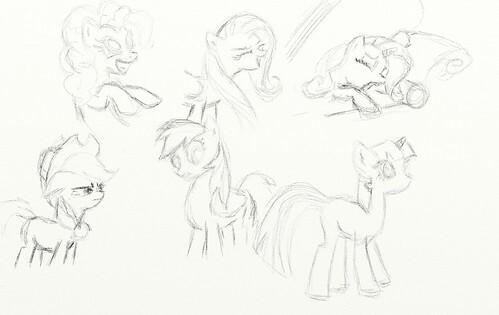 So, I don't know, maybe I'll draw more ponies if the mood strikes me. I'm pretty sure that drawing ponies is what I did instead of playing more Star Wars: the Old Republic, not what I did instead of writing fiction, so what the heck. It's all good. After approximately forever, I finally finished the art card for tuftears. Crappy cell phone pic below because hooking up my scanner is ... problematic. Five Black Griffons, originally uploaded by Lady Rowyn. terrycloth switched viewpoint characters on his story, "Familiar". So I had to do a picture of the new POV character. (OK, I didn't have to. I wanted to, though.) This is Five Black Griffons. Yes, all of the figures are one character. Five Black Griffons is a gestalt: a single person made up by combining (in this case) five individuals. Gestalts can control multiple bodies; Five Black Griffons controls the bodies of the two space otters who joined them, plus a multitude of black bats and rats. 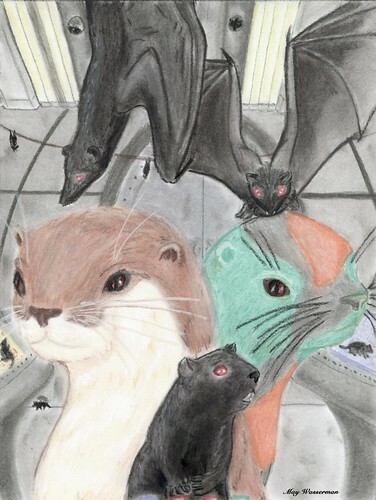 I drew both otters and threw in two bats and one rat in the foreground to represent the five total components, but there are a lot more rats and bats that belong to the gestalt, which is why there are more of those in the background. 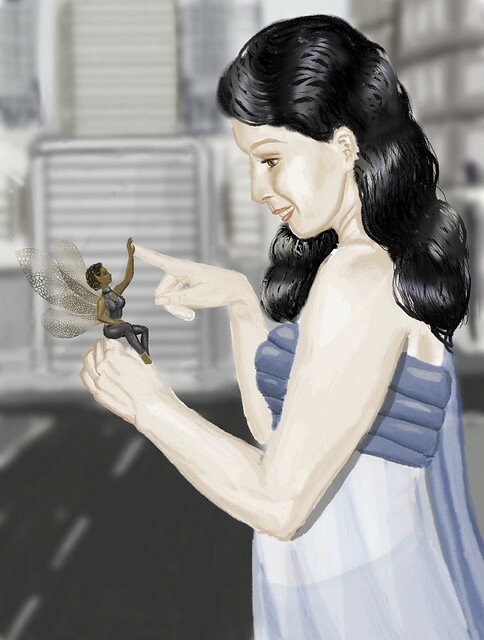 The dominant figure is supposed to be Era, the main protagonist from terrycloth's latest story, Familiar. She looks more-or-less like an otter with the coloration of a grey squirrel. This weekend, having finished the art card project, I found that I kept thinking about doing art anyway. By midday Saturday, I gave up and decided to work on a new picture. During my multiple art supply runs, I'd come across something called "Aquabord". It's "Claybord textured", and appears to be a piece of the kind of board used to make clipboards (chipboard, maybe?) coated in some kind of clay. ursulav had sung the praises of clayboard before, so I was curious about it. This stuff was supposed to be for watercolors, and one of the things that annoys me the most about watercolors is the way the medium warps the paper. Well, this stuff clearly wasn't going to warp for anything short of being thrown in a pool for a couple of days, so I picked up a package of three 5"x7" boards. 5"x7" is four times the size of the art cards I've been working with. Huge! I spent an hour or two looking at pictures of otters and references in DragonArt. At one point in DragonArt, J. Peffer illustrates the principal of giving your figures realistic-looking anatomy, but not by directly basing them on real animals. In so doing, she draws this adorable cat-dragon -- kind of a dragon-skin on top of a cat body. It's so cute! I kinda wanted to do that with this figure, but didn't. The gigantic pale purple tree in the background is the trunk of the World Tree, so many miles away that distortion from the atmosphere turns it hazy and blue, the way distant mountains look on Earth. I tried to make it obvious that's what was going on by having a receding line of mountains in the nearer distance, but I'm not sure it works. I got the idea from an illustration haikujaguar did which had the World Tree trunk in the distance like this, and thought it was so cool I had to try it myself. 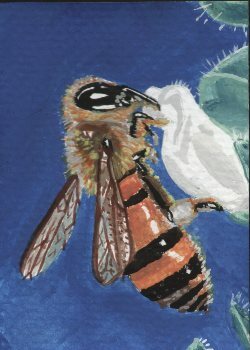 My second watercolor painting, and probably my favorite of the whole set, at least as far as technical skill goes. It's on textured paper, because I couldn't tell which was watercolor and which was textured in the variety pack. Later I bought more watercolor cards so now I know which is which. 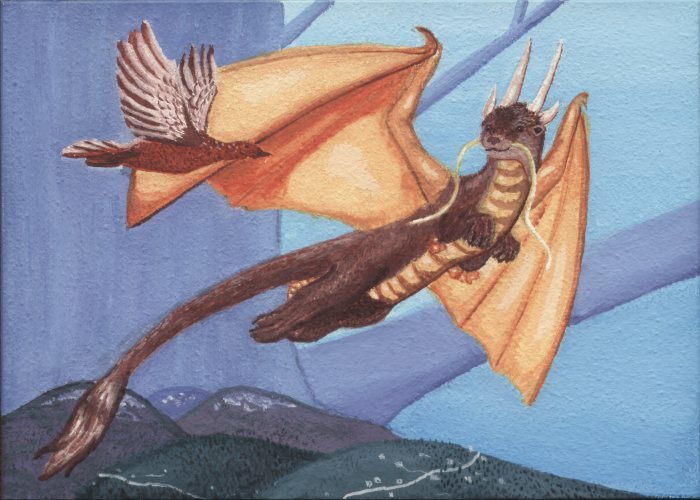 I was browsing through haikujaguar's art archive from 2001 or so, and she had some pictures up where she'd been practicing drawing dragon wings. I thought "That looks like fun", so I started drawing a dragon wing, which went fine. Then tried to draw a dragon body, which did not go as well. Then I remembered that I have a 'How to Draw Dragons' book (DragonArt) that koogrr got me several years ago. Yay! I got it down and used it to draw this dragon, which I quite like. I did two more dragons after this one because I was enjoying using the book so much. Oh right, I was going to link to the mermaid card separately. Here she is! This is a marker-piece I started ... a long time ago. Eighteen months? I worked on it sporadically for a really long time, and eventually pronounced it done in October. "Done" here meaning "It's never getting any better and I'm sick of working on it". I tried to give the original to terrycloth as a birthday present, but failed. I will probably try again. Bringing a frame next time, so that I won't store it in my sketchbook for safekeeping after showing it to him and then taking it home with me by accident. Well, unframed artwork just gets destroyed anyway. 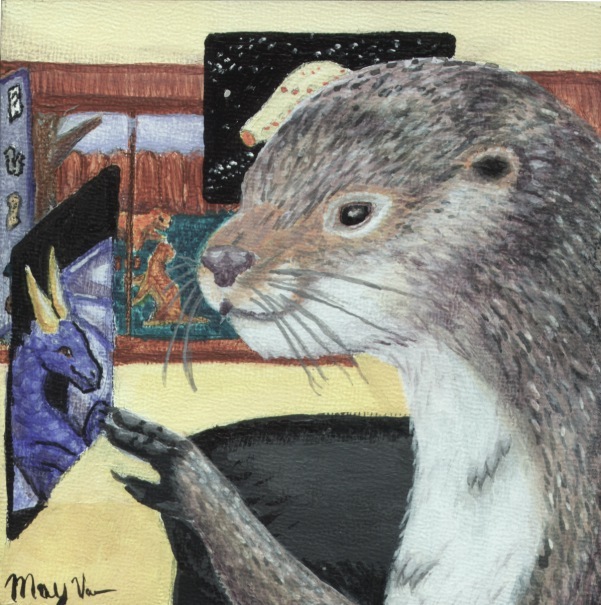 After I posted the Ferret picture for the Crowdsource Tarot, octantis commented with a link to okojosan's weaselblog, which is chock full of adorable ferret pictures. One picture in particular caught my eye: Marcus Is an Oaf. The thing that really grabbed me about this photo was the combination of adorable and sinister. It's a photo that says to me: "I am eviiiiiil! I will eat your sou!! Rub my tummy!" It immediately made me think of Kijji, terrycloth's sometimes-weasel demon, who is insane, evil, and strangely cute. Terrycloth has been writing about Kijji in a World Tree fanfic recently, so I decided to take a stab a doing a portrait of Kijji using the photo as a reference. The portrait is based on a description of Kijji I have from MUCKing with Terry, rather than any form he's used so far in the LJ story. okojosan generously provided me with a larger version of the photo to work from, and this is the result. And an icon-sized version, with a caption provided by Lut that seemed appropriate for both Kijji and the picture. This is intended as an illustration of the Ferret card for the immensely cool Crowdsource Tarot, which was created by beetiger and bard_bloom based on words chosen by 87 of their friends. I wanted to draw this one in particular because "ferret" was the word I offered. Icons: Perfect for Any Occasion! These were more fun to do than to format for posting. Phew! I hope you like them, beetiger, koogrr, ltwarhound, minor_architect, sythyry, and terrycloth. 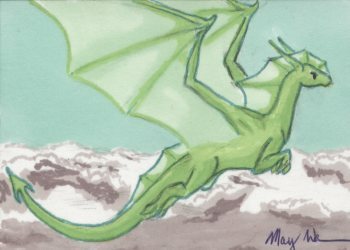 bard_bloom asked for dragons, so I drew two from his latest novel, Mating Flight. I had a lot of fun drawing them! the_vulture asked for a sketch of his character from the Traders PBEM. Here he is. Click for the bigger version!